You see the world growing every day, don’t you? From the time when we were kids and having a telephone in the house was a luxury, we have traveled ahead to the time when every person has his own mobile phone. You no longer need to stand in queue for a long time just to hear the voice of your loved ones; they are just a tap away! Technology is leaving every milestone turned to make our lives easier, comfortable and faster. And it is not just about staying in touch with your friends or family, but the access to the world of knowledge and information too, is merely seconds away from you. It seems as if the libraries are stocked in your phone, you just need to choose the topic and read on! And with so much of information stored in the phone, technology went a step ahead and gave us the iPad! Along with the rapidly growing technology around us, there are various fields that are adapting to the new boons of technology. The field of education is one of them. So much has changed today from our parents’ times, where they had to sit in the library for hours to make notes for a subject, or had to attend a demonstration of an experiment to understand it. With the internet right in your hands, it has become much easier to access anything at anytime. The iPad too, helps us in many ways when it comes to classroom, either for studying or for teaching. It is helpful both for the teachers and the students. 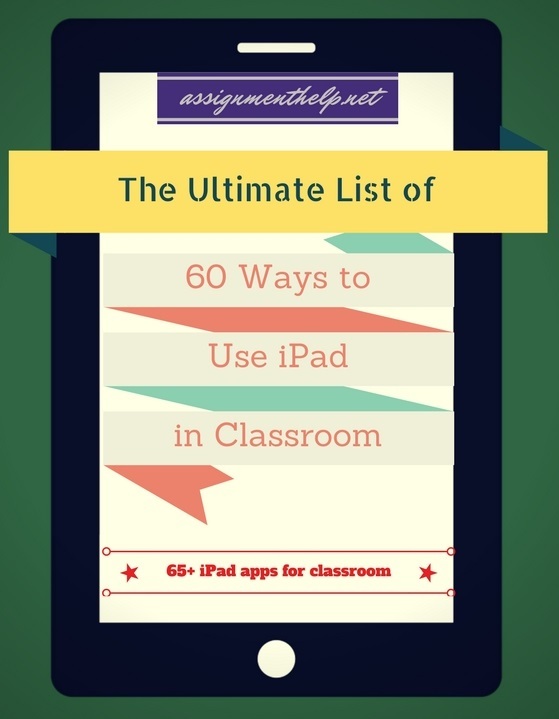 To make the best use of an iPad in your classroom, here are not one, two, five or ten but a hefty 60 ways to explore more with the help of an iPad. So the next time you attend a class, you can easily achieve your goals with your iPad! Music is an interesting way to make the class more interactive and interesting. While playing the tunes, you can never get children bored of the lessons. And when it comes to iPad, it offers a lot of apps with which students can create their own music. Just play in your tunes in the notes you wish and feel music around you. Try Apps such as Beatwave , Virtuoso Piano, Drumkit . Reading is an essential part of learning, especially at a younger age. Children read their lessons to themselves to memorize it better. Also, it helps you keep a track of the line you read. Check out Epic and Toy Story read along where children can have a fun time in making their own stories and reading them out load in their own voices or with toy story characters. They can listen it back, replay it or share it with others too, for a feedback. And this one goes for sharpening your handwriting! Ifontmaker is the application where you can create your own font with your finger. The alphabets appear in large size, thus making it easier to practice drawing them. It guides you through guidelines, above which you can ‘draw’ your self designed alphabet. After you have completed, the alphabets will be saved as a font. And there you go! You can use it as a font for your use further. We all love drawing, don’t we? But to draw on an iPad? There are several apps which allow you to sketch, draw, paint, doodle or whatever you wish to do. In fact the most interesting tool would be the Apple Pencil. The most natural extension of the pencil, Apple pencil is sensitive to pressure and bed angle and allows users to accordingly create fine/thick lines, shading and various artistic strokes and creative effects with precisions of even a single pixel. Isn’t it interesting to see that an iPad can become your canvas too! Presentations are an important part of career, be it during school, college or professional lives. In the classroom, you can use your iPad to instantly create beautiful presentations easily and present it to the class. You can make it even better by adding videos, sounds, graphics, and animations. Using the Keynote app, it is a simple task to make presentations on iPad as well as sync it across your Macbook. So, when the next time you are suddenly asked to present your presentation in a short span of time, don’t worry, iPad is there to help you out. MyCQ app lets you create, practice and share your own study test on any subject and for any grade. Practice and revise with multiple choice questions where the right answer out of the four has to be chosen. Challenge your friends by sharing your self-created tests as well as get exposure to tens of thousands of tests created by other user and test your level of understanding. There are apps made to help you view your files in any required format. One of them is GoodReader, which is touted to be the “Swiss army knife”. The app allows users to open, view files such as in office, txt, html, pdf, mp3, jpg and others. It is an ultimate productivity enhancing pdf reader which allows you to read, edit, annotate, sign PDF files as well as move and compress files and folders from your iPad. So with this you need not get worried about the supported file format anymore. Dragon Dictation will help you to convert speech into editable text, which can be sent through mails or copied too. And that happens really fast! So this function is a boon for teachers who find it easier to dictate their notes or record important talking points rather than to write. Practicing different mathematical skills such as division, addition, subtraction and multiplication is much more fun than ever. iPad has this fun game called Super 7, where you have to use the given numbers to get 7 as your answer. Discs with numbers 1 to 6 bounce on the screen and users need to connect them by drawing lines so that the connected discs add to 7. Added difficulties like stopping them from bumping into each other keeps kids on their toes with rapid addition and develops mental mathematical thinking skills. With the Mobile Mouse app, your iPad can double as a motion-based mouse/trackpad/remote for the laptop or classroom’s projected computer. This is particularly helpful for teachers and students during presentations. Isn’t it amazing! You don’t have to rush to the mouse to change the slide, or go to the taskbar or anything else! Such a feature can be used in various way with the children. The class session can be made more alive by letting them work together on one board, where they learn various things, all at the same time such as coordination, patience, technical skills etc. Gone are the days when teachers used to dictate the lessons and the students had to write them down to their notebooks. With iPad note taking also goes digital. Use MyScript SmartNote to take down handwritten notes on your iPad and instantly convert them into interactive digital format. Teachers can also use this to send students the assignments, on which they can write and share it back with their teachers. Users can insert images, widgets and links in their personalized notebooks. This application also allows them to record the instructions or important things told in the class, for referring later. The notes created are also searchable and connected to the internet for further research. It not only improves the student teacher interaction better, but saves paper as well. You just saw a pretty flower and want to use it as your background for your project? Cool! All you need to do is edit the picture as per your requirement. And with dozens of photo editing app such as Superimpose, Pixelmator that is a simple thing to do. The photos can be imported or taken screenshot of and then can be used further after processing them such as removing backgrounds, editing, clipping, sketching, painting and more. Whether you are an educator or a student, it has become a must have these days to have an online portfolio. Teachers can use it to save all their presentations, digital content, video lectures, transcripts, projects and more while students can similarly store their group presentations, internship projects, videos, PDFs and more. Apps like Portfolio for iPad allow users to easily create such brandable content which can be easily presented in a very sophisticated manner without the hassles of complicated tools. Looking for iPad apps to stimulate classroom discussions between teachers, parents and students? Check out Class Dojo app. can be done on any photo on citizenship, English, science etc. It is a simple app to manage an online portfolio of all classroom students from your iPad, send them instant feedbacks. It is also very easy to share classroom moments and updates with parents through this. There is also an inbuilt feature for digital badges and honors to reinforce positive behavior. And your favorite gadget can become anything for you. From a recorder to even a doodle board! With painting apps such as Doodle Buddy and you can ‘draw’ your answers to ideas, i.e. make diagrams, sketches or anything which you wish to express in a pictorial way. Saves your paper as well! Mind maps are an important part of our studies. They trigger a lot of ideas related to one topic in different directions. Using apps such as SimpleMind+ or Idea Sketch, choose your topic and begin working on organizing your thoughts into branches. Work well on your mind map so that you can use it anytime later as class notes and for revision or even during project presentations when you need to refer something. And when you study literature, your ipad will accompany their too! Using ipad, you can see the Shakespeare plays, scroll through the scenes, and search for quotations, find dictionary definitions etc and use them for your documents. If you are a BYOD classroom teacher and are looking for an app that lets you and your students watch an online vide, photos or music together in sync then try an app such as DabKick. It lets you sync watching media together so that when you are in a class where everyone has an iPad, you can see the same video along with other students. Also with features of interactivity, it allows you to chat live with all of them on your iPad. With apps that help you make your own comics such as Strip Designer, you can let children express themselves with doodles, drawings and colors in their own personal comic strip. This is a great tool for creative storytelling homework. Their experiences can be kept and maintained as a personal comic. Children should have a sound knowledge about the place they are living and their own planet. With Google Earth, you can have a field trip right when sitting in the class and that too with all the information you would need to know! Students can explore the nearby places, 3D rendering of important buildings, terrains, geographical elements such as oceans, rivers, mountains and important geographic and historical places. Next time in your geography class, use an iPad assigned tasks to perform related to a place, explore the area and make a report of it. GB Road Atlas 250K app is designed for the ipad, which provides a free route map of the entire country. It helps you out with various things such as finding the routes, tourism, sites to visit, places to live and much more. So next time when you are planning your class trip, make sure you carry your iPad. Pacific Disaster Centre’s app, Disaster alert, gives you updates about the information of occurrence of active hazards and natural disasters across the globe. This is especially incredible if your school is in a disaster-prone area and can help schools to prepare timely for any upcoming emergencies. But you can keep a well updated track of the things that have happened not only in your nation, in fact across the globe. Apps like Evernote allow you to maintain your notes and accounts in an online account under your access. To make it work, have Evernote logged in to the projector in the class. You can take down your notes during discussions, make annotations while brainstorming and then sync it with the Evernote account. A great way to save your work, you can save your work and refer from it later. And when the group projects happen, the stress levels soar up for everyone. The work is happening here and there and you have a deadline to meet. To work well in a team, make use of your iPad. Apps like MetaMoji Note can help you coordinate better with your group members by sharing the notes, annotations, data, graphics, layouts and more anytime or updating each other with new ideas or decisions. iPad indeed is more dynamic than a laptop for such uses as it can be easily passed around, propped up or can share things. Without buying the music instruments, you can make up your own tunes and songs with various apps present in iPad. You can virtually play the guitars or drums as long you want to. Next time you have a theatre, skit or drama presentation for school/college try one of these. Tapforms is a database where you can set up various kinds of fields, lists and store information in it. You can store all the information related to the students in your iPad, rather than noting it down on sheets of paper and then forgetting it somewhere. Also, these records can also be shared among the teachers! Want to practice faster reading and better comprehension? Try apps like Spreeder. For the comfort of the reader, you can change the speed of the text as it rolls through the auto cue. This can help children to read clearer and understand better. Puppet Pals is an app where students create their own story, record voice and make the actions with the characters chosen. Here, the students can learn to practice different language fluency and develop great storytelling skills. With the help of PhotoCard app, students can use pictures to make a photocard, write on it and email it. Such a feature is useful to make a book of memories or a journal, wherein they can describe each picture in their own words. In summer holidays students can email their teachers postcards from their vacations and family visits. With this application, it has become easier to record students’ spoken sentences in oral narration tests or for students to even record teacher’s instructions, lectures and dictations. Users can playback when they wish to write it down. As they hear the sentence in the right order, they can remember the next word to speak along. iPad can help you make your own e-book too! With apps like Book Creator, you can create books including children’s pictures book or comic books, textbooks and much more. Write onto the pages and save it, either by using onscreen keyboard or by your fingers. Using this feature, children can make their own stories and share it with each other. iPad games are a fun way to teach students about strategy and decision making skills. One of such game is Pirate Jack’ Treasure Hunt, where the Pirate Jack needs help to go on for his treasure hunt. It has a variety of skill assessment challenged involved, such as spelling test, science and numerical revisions. Not just the kids, but the teens also like this one a lot. With the help of the IEP checklist app families and teachers plan for educational services for students with disabilities. Teachers can keep the track records of all the students at one place. Also, it has the capability to record meetings and emails the records. Getting work onto or off the iPad without relying on iTunes is usually a challenge. But DropBox comes to rescue for such purposes. You can share images, files or videos using the DropBox account, which will automatically sync the files wirelessly from one device to another. Teachers can use it well to share files, especially bulky ones, with the students or else it becomes a tricky task to share a file with all the students quickly. And this one can save your phone bills! You can download skype to your iPad and call students and teacher colleagues around in the school, get live video chats with students’ parents. Also, a skype account can be made to collect oral reports, live field research reports etc. from students. Skype is also a great tool if you are looking to connect globally with other classrooms across the world and hold once-a-month video exchange programs with students from schools in various parts of the world. This one is a great tool to use for studying geography and understanding information about economy geography, military, transport and communication, cultures and sociology. Students can have access to land area, population, GDP, average life expectancy etc. for all countries of the world as well as organizations of important reputation. Comparative graphs are also available so as to give a more detailed idea. Get it here. iPad can also improve students’ fluency of speaking with K12 Timed Reading. The application allows students to improve reading comprehension and fluency by reading short, timed stories. Teachers can test all students by tracking the number of words read per minute and also tells whether the student is reading above his age’s reading level or below it. There are issues about theft, storage or convenience commonly happening around. The teachers keep looking for ways to reduce such things. The iPad present in a class can be charged, synced and secured together and stored safely. The information stored in the iPad is safe and cannot be stolen by anyone. Sling Note is a great app to make visually amazing notes faster and better. The app allows users to pair a web browser, a notepad as well as a calculator to create quicker notes with clipping images, news, events, drawing graphics, writing text as well as making better statistical presentations and numbers. Along with the magic markers or the easily changing colors, you can make attractive mind maps, layouts or anything else. The data can be sent in a pdf format. Soundnote is an easy to use productivity tool that both teachers and students can use to take notes. Soundnote tracks the notes that user types as well as records audio. Users can also create diagrams and draw designs and images with Soundnote. Students can obviously record class notes and listen back to the audio at home to avoid missing out on key details and instructions. Teachers too can use sound notes especially when they are performing group evaluations such as classroom discussions so that they can create notes of individual students as well as record audio for careful assessment later on. Sound note is a great app to type notes, add your handwritten notes to it via your finger or stylus. Thus you will have a file which you can both hear and read. Teachers create prompt cards every day for their lectures and presentations. But now they can easily utilize the teleprompter apps on their iPads for the same. There are also Video Teleprompter apps that can help you add the teleprompting features to your videos and podcasts using your iPad and help you read and record your videos at the same time. This makes it a perfect classroom tool to record online lectures, instructions and presentation videos. Google Doc’s iPad app allows mobile editing of Google Docs files from iOS and other mobile devices, facilitating students to easily collaborate and share documents on the go. Students can easily create, edit and collaborate reports, documents, spreadsheets and presentations online even in teams and then can share it with their teachers. iPad can function as instructor’s monitor and help the students collaborate and interact with their teachers in real-time to work together on their assignments. How nice it would be if you can share the screen of your iPad with you friends or your teacher to discuss your ideas and work collaboratively on them! And it is possible with iPad apps such as BaiBoard. It allows sharing iPad screens across many ipad users. All you have to do is to allow the app to ‘share’ the screen and it will enable all users to create and collaborate in real-time to work on documents, images, voice conferencing and document annotation etc. The iPad has made it much easier for the students to explore creatives such as making vector graphics on their own, something which was left to professional designers in previous years. Inkpad is one of the most commonly used apps to teach vector graphics and layers in an easy to understand way. It can be used by all the ages to draw beautiful graphics, illustrations, logos, posters, diagrams and much more. With Apple’s own CLASSROOM app, teachers can easily connect to and assign shared iPads to students. The app connects all nearby student devices (shared and 1:1), can intelligently assign the right student to each Shared iPad and log them out after class. With this single app, the teacher can launch any app, website, or book on student devices with a tap, lock devices into a single app to help students focus or even lock screens to pause work or refocus your class. The Classroom app also allows teachers to get a screen view of all student’s iPad devices as well as to wirelessly present any student’s screen to the entire class. The app can also ease teachers work by easily creating student groups to work in teams as well. The app is a great teacher control center for iPad enabled classrooms. Students can understand the concepts and clear their doubts with online tutors anytime on their iPads. There are various online assignment help and homework help websites that offer iPad enabled online tutoring. Students can connect with tutors from anywhere, anytime and can also collaborate over project planning with teachers or friends. Also, you can take a picture of the assignment or any worksheet and share it with your tutor to review your solutions and help you wherever you are stuck. This one can save you not just in the classroom, but anywhere you go. Using itranslate, you can translate words to any language of your preference. This can be used to teach a new language to the students, or to communicate with someone with a language that you do not understand. You writing your assignment on your iPad’s screen and it comes on the projector too. Amazing right! This is possible with Air sketch , an app which connects your ipad to a computer through a server address. Tangram is a traditional mathematics teaching tool used for teaching students intuitive geometry, fractions and spatial awareness. The online version of Tangram app lets students work on putting together a target picture puzzle with 7 geometrical shapes(called tans). This imbibes a sense of spatial rotation skills based on memory. There are several versions like Tangram! app available for free download. With word matching game apps such as Bluster, it is easy to use an iPad in English learning classrooms or to support English as Second Language Learners. These apps can help English language learners to build up vocabulary by matching rhyming words, suffixes, prefixes, synonyms, antonyms etc. In the collaborative mode it can also be played by 2 players simultaneously and compete. There are options to choose the level of difficulty too. Emojis are a quick and easy way to humanize all the digital content and represent the way latest generation of students express their feelings and emotions. Emojis can be used in different ways. Not just while texting each other, but they can be used in form of riddles, converting sentences into emojis or vice-versa and passed around among younger children. Students can also use it in other creative ways during their assignments to express themselves. Fun emoji based guessing games, quizzes make for great ice-breakers in back to school seasons as well. This app is a great one for students to master their math skills. This challenge lies in slicing a given shape into the required number of equal sizes using a given number of moves. Each level is a new shape, and each stage has increasingly difficult fragmentation levels. And all the kids sit in there using their brains into it. It is a good way to practice concepts of geometry and fractions. Know more about Sliceit here. Students with physical or learning disabilities can also be helped to learn to read and write with an iPad. They can write using their finger, use colors and various interesting effects while writing. Using such options, the process of learning becomes more interesting for them. There are various such apps such as DragonDictation, Proloquo2Go, First Then Visual Schedule, TouchChat and many more. iPad itself is powered with assistive technologies such as Siri, assistive touch enabled with gestures, read out loud features and auto recommend for messages etc. Living in a tech-savvy world, in future every person will be expected to be proficient and skilled in leveraging technology in their career and jobs. It’s simply impossible for the present generation to ignore the growing intelligence of machines and automation. Using iPads to teach coding skills in classroom is exactly the right way that will help children to get passionate about STEM, so that they use technology in an even better way during their college years and in the professional fields. Try iPad-based robotics kits such as Dash & Dot or teach coding through Swift. Document cameras are an incredibly powerful classroom tool to display an object to a large audience of your students by magnifying and projecting the images of actual three dimensional objects and transparencies. By using your ipad as a document camera, you can interpret over anything you set under the camera. Also, you can record what you show too! However all you need is a Camera Stand such as Justand. Justand can easily transform the iPad to be used as a scanner, a document camera, a video camera holder, a video conference center, a music stand, an iPad podium and more. 123D Catch is an amazing application that allows to you make a three dimensional models of images for people, places or anything around you. You simply have to click its picture from some different angles and then upload it on the app to do the rest. Students can also 3D print these models and bring to life their boring 2D diagrams or create stunning project works. Using Quizlet app, teachers can make flashcards for the students, which they can use while working on their assignments or discussing it with each other. By using special sound effects and popular gameshow catchphrases in the classroom with the help of “Gameshow Sound” Board, you can change the entire mood of the class. From a regular boring right-wrong environment, teachers can make the quiz time an interactive fun learning session. The effects are great for young learners who feel more upbeat with buzzer sounds and catchphrases. Looking for ways to express and explain tough concepts with special effect storytelling in classroom? All thanks to the iPad, you can recreate your desired videos using green screen effects from “Green Screen by Do Ink” app. Green screen will let you add uniquely creative effects such as you have landed on the moon. After live shooting the video, photo or artwork, layer your background on top of it to get an awesome special effect! Now export it to the camera roll and edit it further or combine with more clips in imovie. Whether it is a storytelling project, a presentation or teachers looking to hold attention of students, get super creative and live the dreams of being a superhero or fighting an alien, saing the world in your favorite movie! Many times teachers feel troubled about whom to choose to answer the question, or who should be kept in which group. There are iPad apps that can help you in such confusions too! ‘Pick me!’ is one such app that can help you, as it picks up the names randomly. Thus, teachers will no more have the difficulty of making groups again or randomly choosing kids to participate in classroom discussion. This is a fair and convenient way of class participation along with an inbuilt assessment feature where teachers can also record the right response from called-out student as ‘thumbs-up’ or an incorrect response as a ‘thumbs-down’. Now you realize what an ipad, lying next to you can do for you. It can be your best friend, your solution to everything, your mathematics teacher and so much more. The students can get a lot of help from the numerous apps for working in assignments or projects. Also, the teachers can use the ipads to teaching better and managing records of students. And that is what we say as the perfect use of technology, where the gadget can help you in almost, everything! Classroom becomes much more fun to be in and the learning happens in a better way than the regular style. So when you have your next class, pick up your ipad and explore the world of information deeper and better.